Though most companies conduct some sort of succession planning process, few executives feel that they have adequate bench strength. As a result, according to a 2009 study, only a little more than 60% of first level managerial positions and 52% of senior positions are hired from within. First, it’s more expensive to hire externally, particularly at senior levels. Companies need to run advertisements, pay recruiters, and ask internal people to spend company time sorting through resumes and conducting interviews. There is also evidence from a Wharton study that external hires are generally paid more than comparable internal people. After all, most people won’t risk switching companies unless there is a financial incentive. However, the most significant expense is from lost or diminished productivity. Onboarding to a new company and culture takes time, which means that externally hired managers may not add full value for months, or even years – another finding from the Wharton research. The second problem is that it puts the company at risk. Without ready-to-go replacements, jobs can remain open for long periods of time, which can delay projects or reduce the effectiveness of day-to-day operations. What’s even worse is that focusing on external hires sends a signal to internal people that they are not “good enough” to be promoted, or that their opportunities are limited. And without a sense of future possibilities, morale suffers and commitment wanes. Simply going through the motions of succession planning won’t create bench strength by itself – nor will it convince managers that they will have future opportunities. In fact, the best that a good process can do is to analytically highlight the gaps where successors are needed. In one company, for example, the head of talent created a wonderful “book” which mapped out all of the key positions, strengths and weaknesses of incumbents, and successors who could step into these jobs either immediately, in one year, or three years. The only problem, as the Board Committee pointed out, was that there were virtually no immediate replacements for any of the top executives. To make succession-planning a success, there are two inter-connected ingredients that need to be added to the mix. The first is a genuine commitment, at every level of management, that identifying and developing bench strength is a critical leadership responsibility – and that managers need to be held accountable for making sure they have successors in place. This means that while the HR function can provide support and guidance, and coordinate the planning process, it is managers who have to make it happen. The second ingredient is an active development process to prepare people for next-level jobs. This too needs to be part of each manager’s responsibility – to help subordinates identify developmental needs and career aspirations, and consciously build learning objectives into their work. It’s easy for managers to point fingers at the HR function or at senior executives for a lack of bench strength. 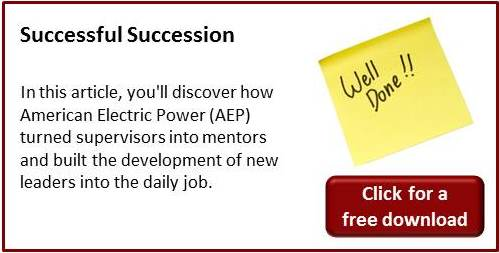 Creating successors, however, is every manager’s job. In fact, if you really want to move on or move up, you need to make sure that you have someone in place who can take over when you are ready to go. Ron Ashkenas' blog post on Forbes. Join the discussion. Patrice Murphy Quoted in "Talent Management"